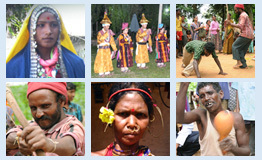 The Malasar tribal community lives in Kerala and Tamil Nadu. They live in the Parambikulam reserve forest of the Palakkad district in Kerala and adjoining forest of Tamil Nadu and they inhabit in the foot hills of the Anamalai hills in southern India. Scholars have opinion that ‘Malasar’ may be the corrupt form of ‘Malai’ and ‘Arasar’ which stands for king of the hills (‘Malai’ stands for hill and ‘arasar’ stands for King).The Malasar tribe lives usually in the settlements of 15 to 20 huts. Constitutionally the community is a scheduled tribe. The Malasar claim that they are Hindu. ‘Kali’ and ‘Mariamman’ are their favorite’s village deities and the worship of various spirits and succubus are also practiced. ‘Mattu pongal’, ‘Thai pongal’, ‘Deepavali’ and ‘Onam’ are major festivals celebrated by this tribe. Their culture has many rituals and rites. They have oral tradition in the form of folksong usually sung by the women. Their traditional occupation was collection of minor forest products but now they are working as laborers in the fields. They cultivate ragi and many other kinds of millets. Presently, an attempt to document the Malasar language and community is in progress under SPPEL. The pilot survey has been conducted and some amount of data has been recorded in the fieldwork. The outcome of this documentation project will be a grammar of Malasar language, a Malasar-English-Tamil trilingual electronic dictionary and a Malasar ethno linguistic profile of the community.